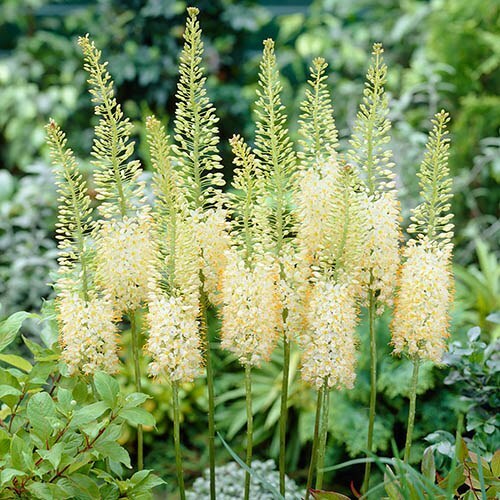 Rising from the garden like blazing rockets, foxtail lilies bring a little height and fire to your garden. Make a bold statement in your borders with Eremurus 'Tropical Dream' - a fully hardy yet exotic-looking perennial. 'Foxtail Lilies' add height and interest to your garden with spectacular flowers from a compact growing plant. Spires of amazing creamy-white blooms are long-lasting and impressive. Easy to grow in any well-drained soil, in full sun, and will reach up to 1.2m tall when in full flower. Supplied as a large, established plant in a 4L pot to plant out straight away. Punctuate your garden with colour this year with the delightful Eremurus 'Tropical Dream' a fully hardy yet exotic-looking perennial that will amaze everyone who sees it. The elegant flower spike of this variety is packed with creamy-white flowers with orange anthers which will add classic style to your garden. A relatively compact form, 'Tropical Dream' tolerates more exposed positions where it will put on a dazzling display. Also known as Desert Candles, the impressive flower spires are packed with star-shaped blooms, creating a bottlebrush effect. The flowers open from the bottom of the spike upwards in a wave of subtle colour change that cannot be missed, and the tails often bend as they grow - looking even more like the jaunty tail of a fox. Growing to (1.2m) 4ft tall, these fully hardy, dramatic-looking plants are perfect for the back of sunny borders where the towering spikes emerge from fleshy roots, which are not unlike a giant starfish. The orange blooms are long lasting and over the years they will grow into large, prolific clumps. Easy to grow and supplied as an established plant in a 4L pot, ready for immediate planting - then you can leave them alone! Mark the position of the plant with a cane or similar to avoid accidental damage when dormant. On receipt, plant straight away and feed well when shoots emerge. Then leave them alone! Take care when planting as the roots can be quite brittle. Grow in full sun in moist, well-drained soil. Alternatively, can be grown successfully in a pot. Before planting, prepare the soil by digging over and removing any weeds. Incorporate organic matter such as garden compost to open up the soil. If the soil is heavier, to aid drainage, consider raising the soil level of the bed intended for planting. Knock the plant from its container. Use a trowel or spade to create a hole just deep and wide enough to set in the root ball. Add a 2.5cm (1in) layer of horticultural grit to the bottom of the planting hole. The aim is to set the plant to the same level as it was in the pot, leaving the base of the shoots or stem above ground. Backfill around the plant and firm in well. Water in well to settle the soil and prevent desiccation. This would also mark a good spot for inserting a stake, if needed. Once in active growth, feed with high potassium fertiliser such as sulphate of potash. Keep plants well-watered when in leaf. When dormant in summer they enjoy dry conditions. Foliage begins to die back after flowering and should be allowed to die back naturally. Unless you are keeping seed, flower spikes can be removed when the blooms have dropped.